Ever since I’ve had my own homes, I like to brighten up the interiors with whites and cool blues. During spring and summer months, I’ll bring in more color with flowers and accents. Our dining room only has one window in it, but I’ve managed to bounce the light around with pale walls and white furnishings. I know some people think white makes a room seem cold, but just look at Scandinavian homes. They use lots of light color to help brighten their living space during the short days and their homes are quite warm and cozy. The walls are painted Steam White by Valspar, which is sold at Lowe’s. It has a bluish-gray undertone. 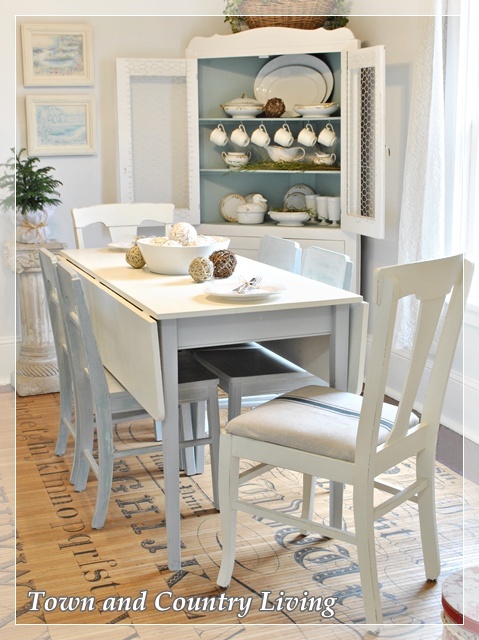 The table and end chairs are painted Old White using Annie Sloan Chalk Paint. I reupholstered the chair pads with faux grain sack created from drop cloth. 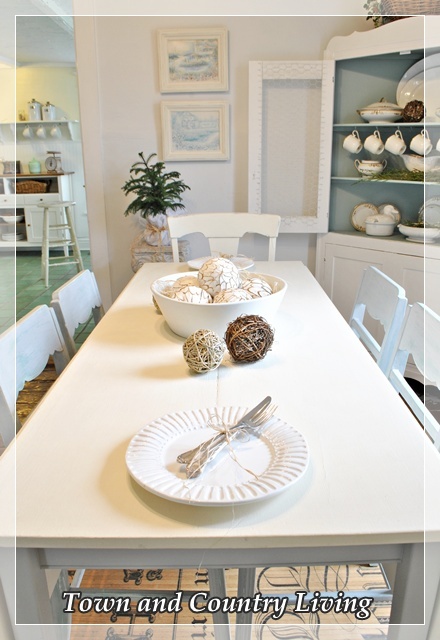 Simple white dishes are used at the table with a bow of raffia holding the silverware together. My new white ironstone bowl is filled with textured balls. The bowl is slightly misshapen which makes it all the more special. I prefer simple settings throughout my home. Less fussy means less cleaning which means more time for fun stuff! The buffet is surrounded by vintage mirrors to help bounce the light around the room. The pillows are new finds from the local flea market. 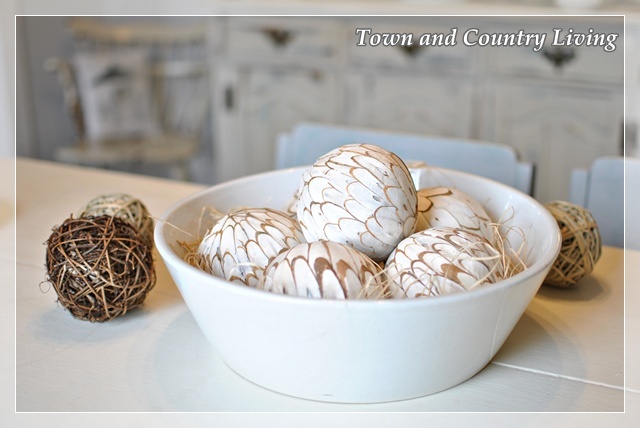 White ironstone and a few natural touches of greens and textured balls are all that’s needed for tabletop decor. I’m still adding pieces to my ironstone collection. I love the imperfections of this pitcher. The dining room always puts a smile on my face. It’s where we gather with family and friends to enjoy home-cooked meals. I ‘ve started running again too. iI’s tough – I hate being cold and it’s been really cold. I really want to try your recipe for macaron’s but I’m trying to eat better too since I’m killing myself running… Drat! Your dining room looks lovely. I tend to choose pieces with more patina ( partly because of the savings… partly because I feel sorry for misfit china and need to give it a home ). Hi Jennifer, Love your style! I have that same rug that you have in your dining room. 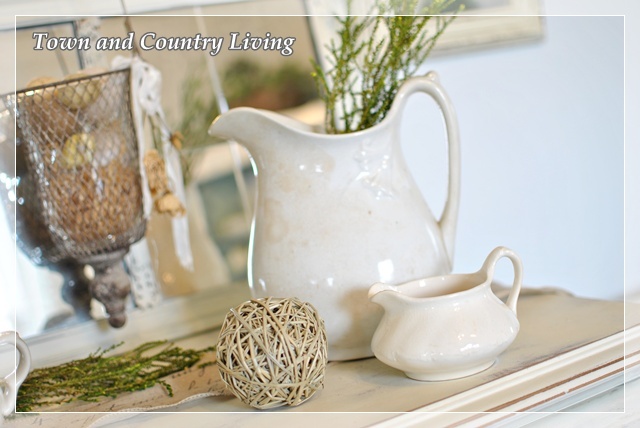 I collect white ironstone, too, and love all the imperfections. Your home is lovely. These are all great ideas. Perfect timing for me as I’m looking for ways to lighten up : ) Thanks! Jennifer, I love your home so much!!! Everything is fantastic and your photos are great! With such a beautiul place you made with that desk you really don’t need a foyer (previous post). Those macarrons look so yummy…but I’ll try to follow you with the other post, the one speaking about health and running! P.S. : those egg-cups are so cute! (remember I’m a pocillovist…haha). Just dreamy…love the blue and the white! I’ll also try to follow you! Oh everything looks beautiful, congrats on moving to WordPress…I’m currently learning my way around and hope to make the change in a few months. Hello . What a luvly room Jennifer. The white on white is so soothing. I am looking at your iron stone pitchers… I had only 1 🙁 It was in the sun room last summer. Looking luvly. I had all the windows opened, a gust of wind caught a canvas I had leaning on a cabinet, which toppled over sending my pitcher toppling onto the ceramic tiles. OH NO!!! So I am on the look out for a replacement and a few to keep it company. Thanks for sharing your luvly dining room. Luv the sideboard!! Love the soft neutral feel. Its airy and inviting…love it!! What a lovely lovely room, Jennifer. Everything is light and fresh, but still feels cozy. The buffet (and that whole wall area) is just amazing. Thanks for sharing your dining room, and all the beautiful details. I’ll make sure I get switched to your new web address! do and enjoy colour during the summer months…..something to think about. Jennifer, I am still getting your blog in my reader so on my end there was no transition problem. Thanks for linking up to my party, your place is always fab…. and I love every inch of it. I am currently moving to WP also. Did you make the move yourself? That’s how I am doing it, was wondering if you lost anything in the transitions? You’re still on my blogroll, so I didn’t have to change anything to keep following. I forgot to mention how much I like your new blog look with your light and airy blog header! Your home is looking lovely and I’m anxious to see some spring colors, too. We woke up to another 4 inches of snow this morning. You’re in my blogroll, but I didn’t get the post with cookies, so I added the new URL. 🙂 I’ve never mentioned how beautiful your buffet is. 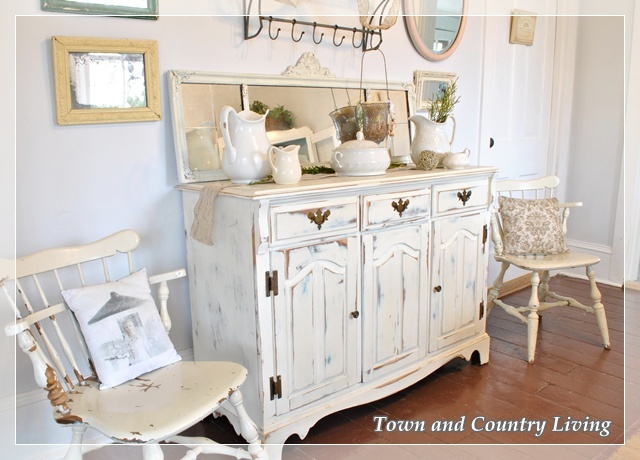 It’s distressed beautifully! Jennifer, I’ve told you this before, but I just love your home and your style! The color of your dining room wall is beautiful. Thanks for sharing and for providing the name of the color. Visiting from Tuesdays Treasures. Your house is beautiful. I love the all white look you have given it. Such a beautiful dining room! 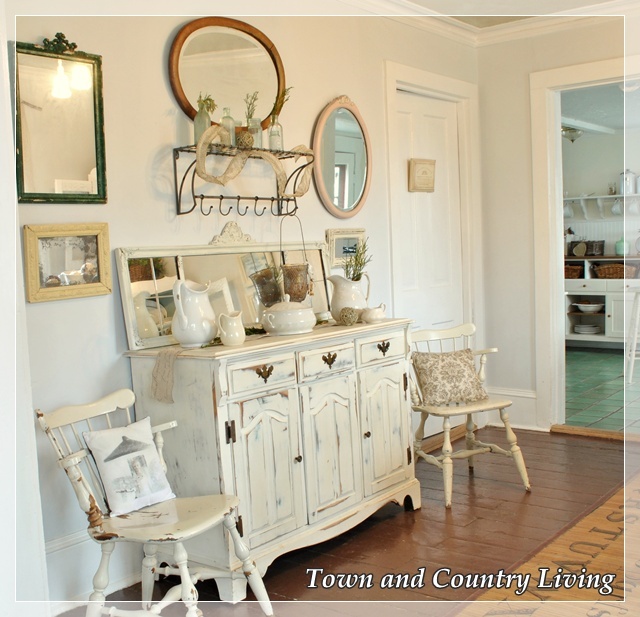 I love the way you’ve styled everything from the shelves in your lovely cabinet to your fabulous buffet! Gorgeous pieces, indeed! Your dining room is lovely, very fresh and bright. I love the colour on your wall, you say it’s white, but it has a gray tinge to it, doesn’t it? That’s what I’m seeing, anyway, it’s beautiful. Your dining room is beautiful and fresh! I love getting simple settings for my living room. I preferred using dirty white color to emphasize the vintage look. In addition, you did a great job for your living room from the furniture pieces to wall decor. Your room is so bright and I love the changes you’ve made to it. You always manage to keep it fresh and new yet cozy and warm. Welcome to word press my friend!! Your room looks beautiful! LOVE all that soft white! Lovely “freshening up”…yeah, I am doing that too! Your dining room is beautiful. I love the soft blue with the white. So calming. I’d love it if you linked this to my new linky party, “What We’ve Accomplished Wednesdays.” It is live right now. Your home is lovely! The dining room looks great! So pretty. It has such a fresh and light feel. I just love it. As always Jennifer your home is so beautiful. I like the fresh and bright feeling you gave to the dining room. It looks so nice. 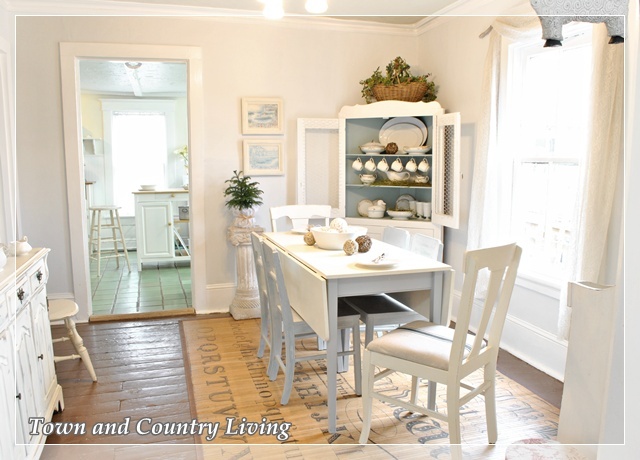 Congrats on the feature at Savvy Southern Style! I love your kitchen and Your whole house. And that vino and appetizers sure sound good! Im only a few little towns away! Love your dining room. Everything is beautiful. The neutral color pallette is fabulous. Love your gorgeous home. Your vintage pieces are just divine. The dresser and chairs are wonderful! Wow what a gorgeous space you have!!!!! Hi Jennifer! I just found your blog after seeing your post on your kitchen. I fell in love with it immediately! I had to pop over and read a few of your posts. We are almost neighbors! We live on the Southside of Chicago (Evergreen Park/Oak Lawn area). My husband went to law school at Northern in Dekalb (I saw that you were shopping there in one of your previous posts). 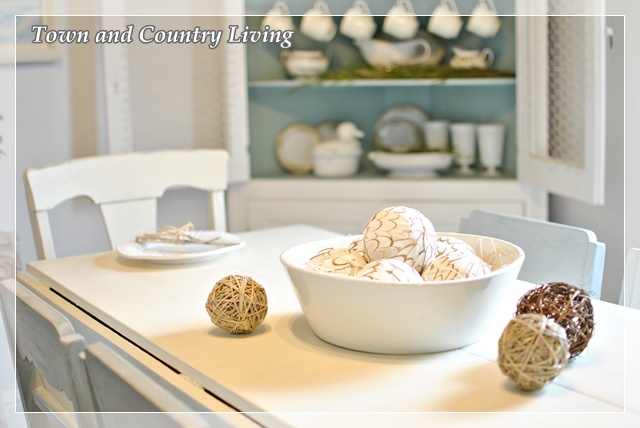 So, I look forward to following your blog and the latest on your decorating and projects. You have a lovely home and even lovelier family! I love your style so so so much! I could just stare at your photos for hours! I am pinning your space to our Inspiration Gallery Pin Board! Thank you so much for linking up! I don’t know how you keep your house so clean and spotless with all white. Your dining room is so inviting. or sorta like it… beautiful room! So fresh and pretty. I have the same rug only mine is smaller and in my entry. So far it’s indestructable! Really love the dining table, where can I find it. Hi! Love the soft blue color you are using as an accent on walls and furniture. What is the name of it? I have the same question as Deborah…what color of ASCP did you use with the chairs?